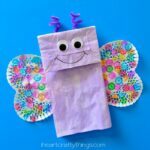 Spring is officially here and that means I can get giddy about creating pretty butterfly and insect crafts. 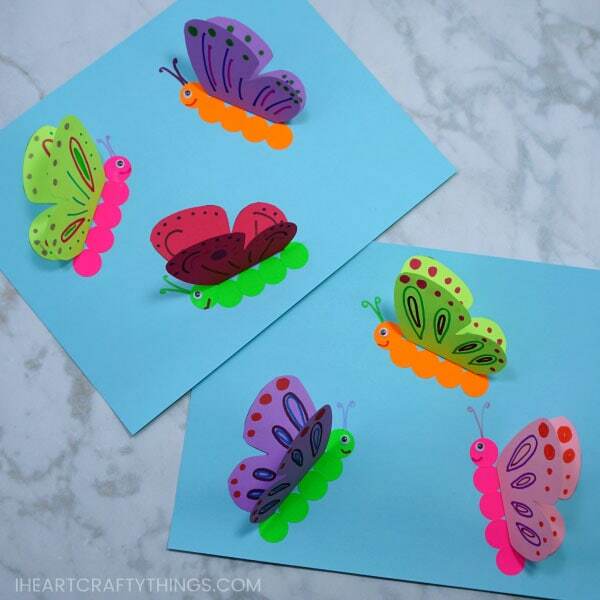 Today we are sharing how to make this simple 3D paper butterfly craft. It’s a simple and colorful spring craft that kids of all ages will love. 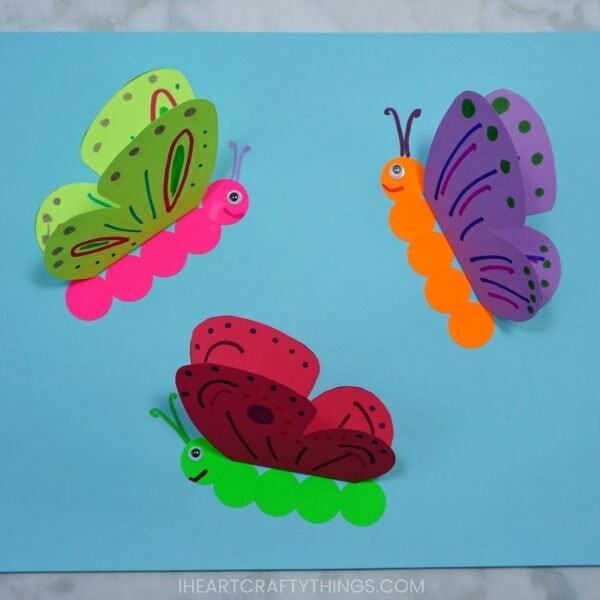 Kids will adore using their creativity to design the wings of their colorful butterflies. 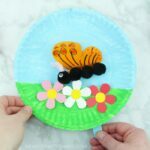 Download the template for this simple paper butterfly craft after signing up for our newsletter at the bottom of this post. 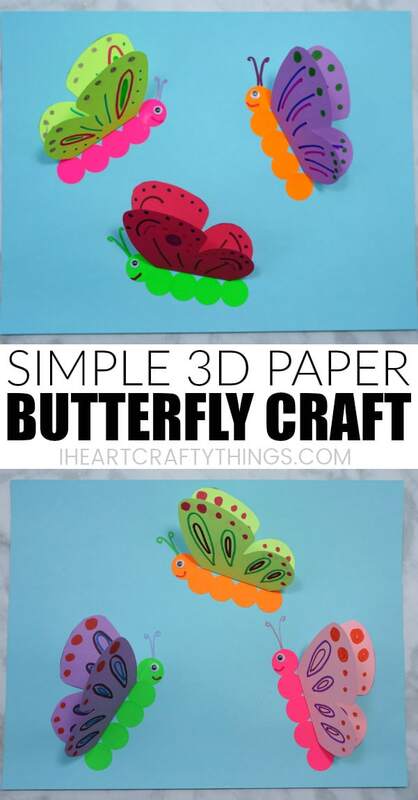 3D paper butterfly template <—-Get at the bottom of this post. 1. Sign up for our newsletter at the bottom of this post and download the free 3D paper butterfly template. Print it out on colored cardstock paper. 2. Cut out the butterfly templates. We added three paper butterflies to our paper but you can choose however many you would like. 3. Lay the butterfly template face up. Use your markers to decorate the butterfly wings. 5. 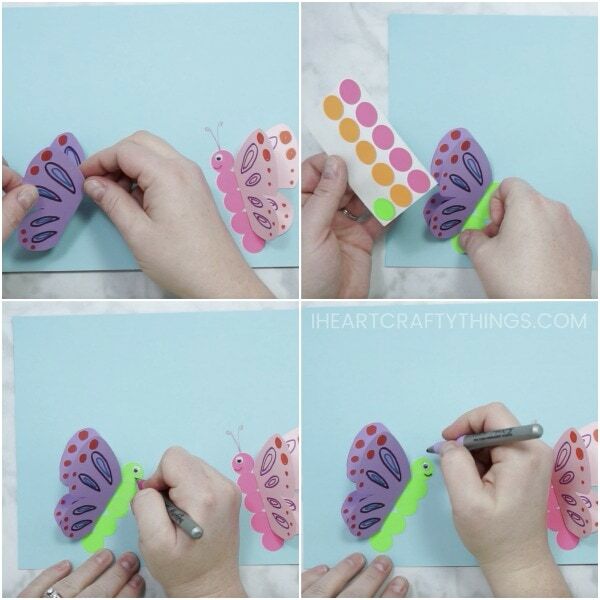 Add glue to the bottom of the folded butterfly wings and glue it onto your blue cardstock. 6. Add five round Avery labels at the base of the butterfly wings to create the butterfly body. 7. Glue a small googly eye onto the face of the butterfly. 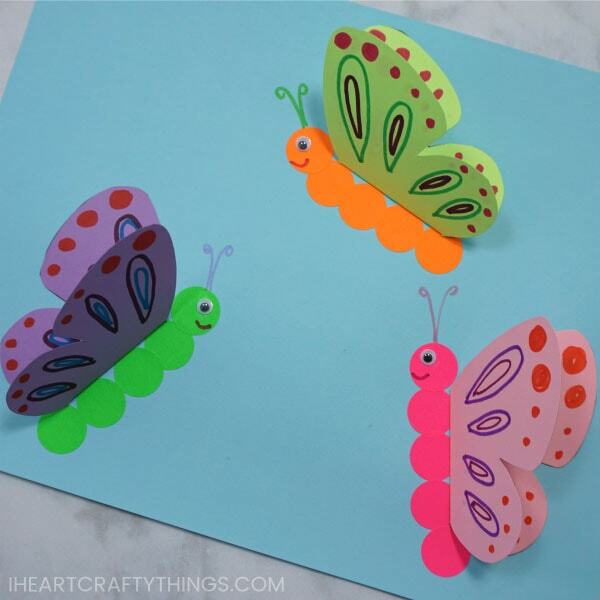 Then use markers to draw a smile and antennae onto your 3D paper butterfly craft. For some additional fun, draw colorful flowers at the bottom of your paper so it looks like your butterflies are out for a snack. Looking for more fun 3D paper spring crafts? These colorful 3D paper tulips are a perfect craft for spring time. 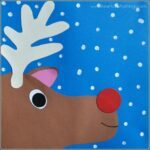 We have a printable template available for this craft as well. Mother’s Day is right around the corner. Make a 3D Hyacinth flower card to give to your Mom or Grandma for Mother’s Day. Pink paper circles are perfect for creating this gorgeous spring tree craft. You can even make one for every season of the year. These 3D construction paper unicorns are fun for any time of the year! Enter your email address to join my weekly newsletter and get FREE access to the butterfly template! After you click 'enter', a pop-up with the template download will appear. By entering your email address above you agree to be added to my weekly newsletter list. Rest assured, your info will never be shared with anyone and you can unsubscribe at any time. If you are already a subscriber, enter your email again to gain access to the template. Hi! After the last picture in the blog post there is a big rectangle box with a pink dotted border around it. Enter your email address in the blue box and hit Enter. That will subscribe you to my weekly newsletter and a download of the template will automatically appear for you. If it doesn’t appear, check that you don’t have pop-ups disabled, or look for it in your download folder. Email me if you have any problems: rachel@iheartcraftythings.com. I am looking for something nice and cheery for a thank you card for a bereavement for my daughter. She loved yellow tulips but I need the template please. How/where can I get them? I would like to have How to Make a 3D Paper Butterfly Craft. One of my Granddaughters loves Butterflies. Hi! If you would like the butterfly template, look for a big rectangle box with a pink polka-dot border around it near the bottom of the post. Inside you will find some instructions and a blue box to input your email address. After you enter your email address and hit Enter, the template should automatically download to your computer. Please let me know if you have any more questions. Hi Karen! Look for a big rectangle box with a pink polka-dot border around it near the bottom of the post. Inside you will find some instructions and a blue box to input your email address. After you enter your email address and hit Enter, the template should automatically download to your computer. Please let me know if you have any more questions. They look like fun to make. Hi! If you are trying to get the template, look for a big rectangle box with a pink polka-dot border around it near the bottom of the post. Inside you will find some instructions and a blue box to input your email address. After you enter your email address and hit Enter, the template should automatically download to your computer. Please let me know if you have any more questions. I volunteer at a hospice home every Friday. I get most of my crafts from Oriental Trading. I have seen several of your crafts on Face Book and they look wonderful. I am anxious to see how this works. The people can do anything a 7 year old can do. I’m always looking for fun crafts to do with my granddaughter. This one is perfect!! I love all of your craft ideas. I teach a preschool at our church and have 4 and 5 years old. I have been doing daycare in my home for 35 years and will be retiring next year. So I would love to have new ideas my last year of helping kids learn. Hi! Look for a big rectangle box with a pink polka-dot border around it near the bottom of the post. Inside you will find some instructions and a blue box to input your email address. After you enter your email address and hit Enter, the template should automatically download to your computer. Please let me know if you have any more questions. 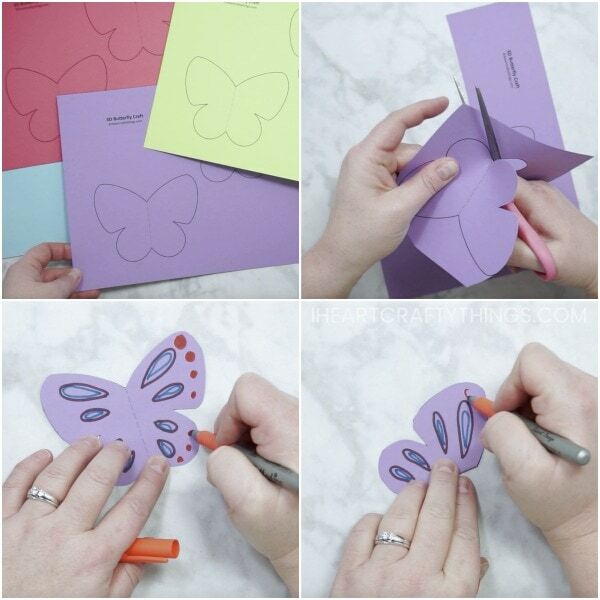 love the craft butterfly idea. you can use child’s thumb or finger print instead of the color Avery stickers. Hi Sophie! Look for a big rectangle box with a pink polka-dot border around it near the bottom of the post. Inside you will find some instructions and a blue box to input your email address. After you enter your email address and hit Enter, the template should automatically download to your computer. Please let me know if you have any more questions. Left my e-mail address twice and no templates. Hi Anna! Look for a big rectangle box with a pink polka-dot border around it near the bottom of the post. Inside you will find some instructions and a blue box to input your email address. After you enter your email address and hit Enter, the template should automatically download to your computer. Please let me know if you have any more questions. Love the little butterfly. How very SWEET! Hmmm, I haven’t had anyone else with this issue. Do you mind emailing me at iheartcraftythings@yahoo.com and I can send you the template.